I’m a taco fiend. A few years ago if you asked me what diet I followed I’d tell you “Paleo + Tacos.” Though I don’t put a label on my diet anymore and I don’t eat strictly Paleo, my meals are still mostly vegetables. I see every meal and snack as an opportunity to get in more vegetables and fruits, but sometimes it’s hard when tacos are on the menu. Aside from the guacamole and maybe some of this killer Mexi Slaw, the veg-factor in tacos isn’t very high. 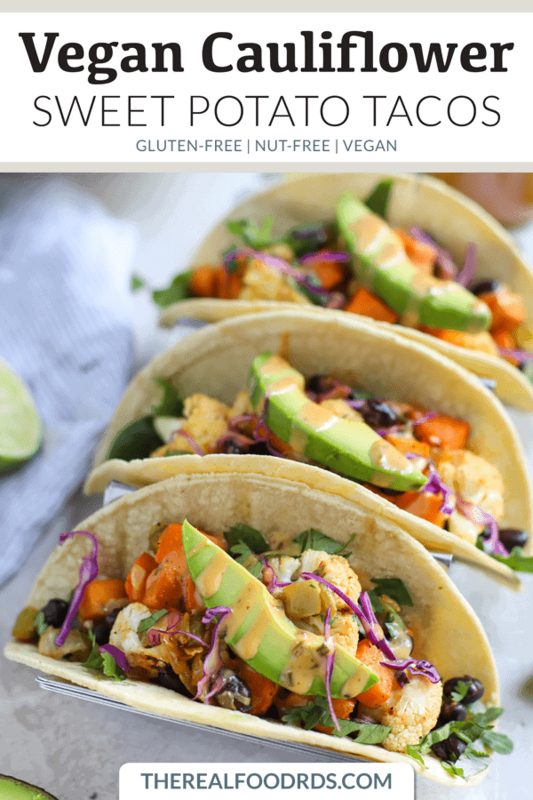 This, combined with the fact that I often have vegan friends over for dinner, inspired me to create a simple, one-pan dinner that had everything I love about tacos plus loads of fiber-rich veggies. 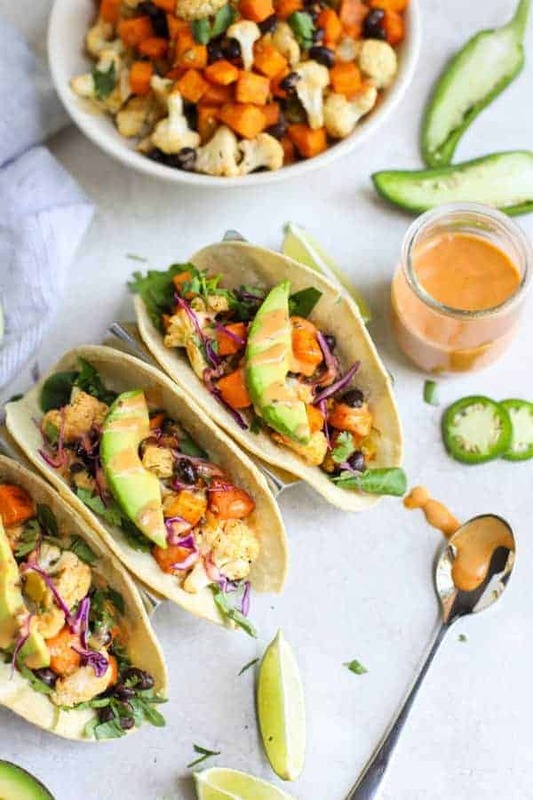 Allow me to introduce you to my newest #TacoTuesday crush, Vegan Cauliflower Sweet Potato Tacos with Chipotle Ranch. 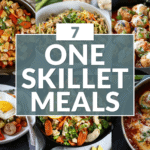 One-pan meals are where it’s at. Even if I had all night to cook, chances are I wouldn’t. 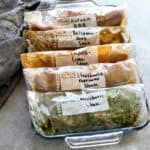 I love cooking (I mean, I do it for a living! ), but I also love being outside and playing hard. And I’m not a fan of washing dishes…neither are my spouse and kids. Which is why I LOVE healthy meals you can legit make using one pan. 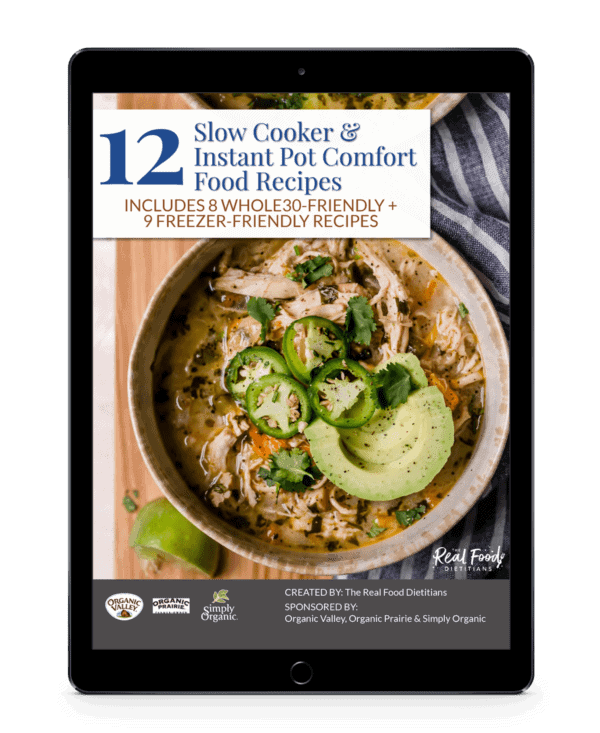 Though you have to do some in and out of the oven for this recipe, once you have the veggies prepped, the spices mixed and the beans rinsed and drained, it’s like 3 minutes of hands-on time. 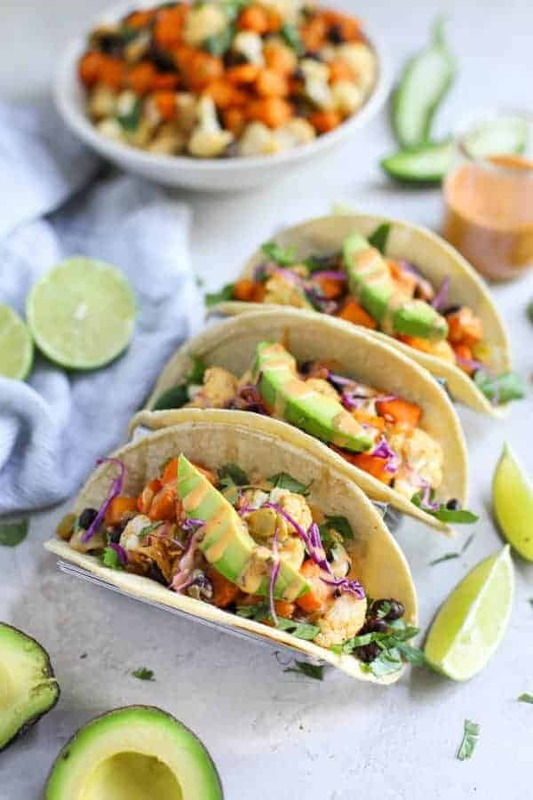 The rest of the time, you chop cilantro, slice limes and avocados and make the Chipotle Ranch to drizzle alllllll over every taco you’ll ever eat from here on out. Exaggerating, I am not. 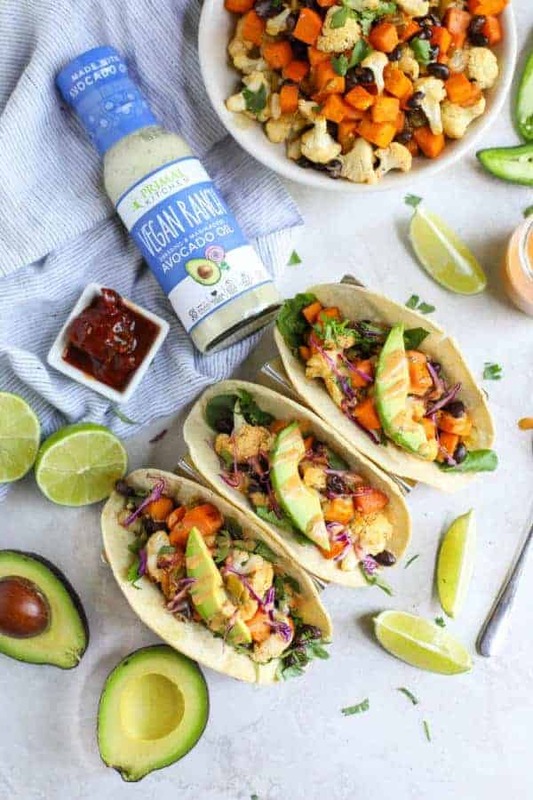 I already alluded to this, but I went ahead and whizzed together some Primal Kitchen Vegan Ranch Dressing with a little (OK, maybe more than a ‘little’ chipotle pepper) and made the dreamiest sauce to drizzle all over these Vegan Cauliflower Sweet Potato Tacos. Hello, taco heaven. And it was the best decision I made all week because I’ve been putting the leftovers on everything. As you may already know, eggs and I don’t play well together. Like, ‘Hand-me-an-EpiPen’ don’t play well together. 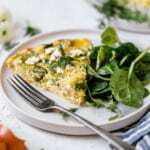 I haven’t always been this allergic though I suspect that as a child I had a very mild allergy (eggs always made me feel terrible and I had chronic hives). Add to that repeated small exposures in baked goods, ice cream, etc. 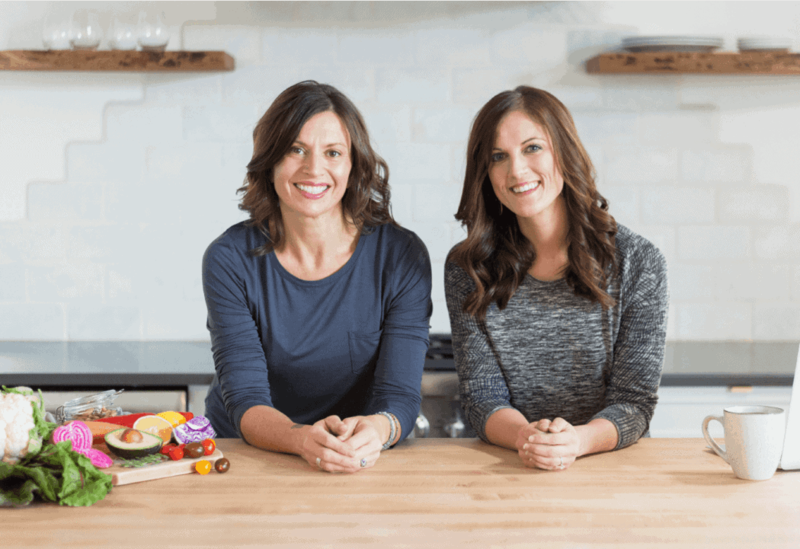 plus leaky gut and an autoimmune disease and somewhere in my late 30s I developed full-blown anaphylaxis after an accidental exposure to scrambled eggs (my toddler unknowingly flung them off her fork and into my coffee cup). All that to say that although I’m not vegan, I do use a lot of vegan products because I KNOW they’ll be free of eggs. I even order vegan meals at restaurants and ask to have fish, poultry or steak added to them. I may get funny looks but hey, it’s better than dying, right? 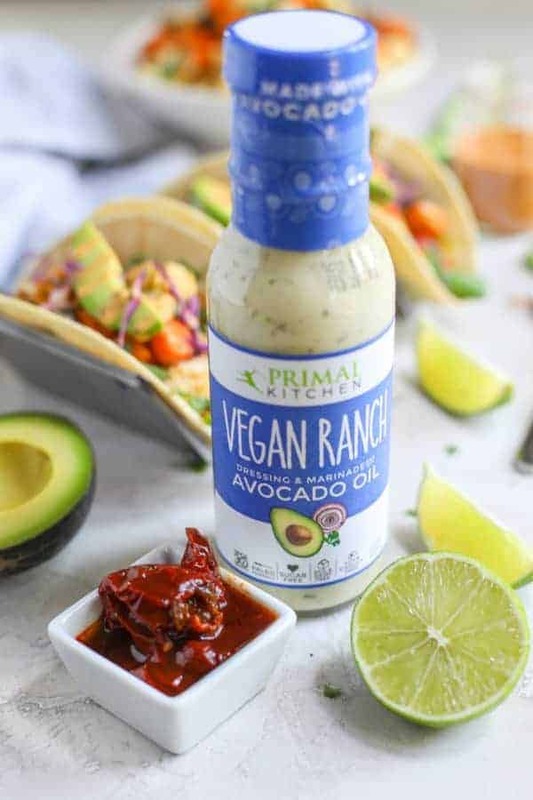 All that to say that I’m doing cartwheels over here now that Primal Kitchen has a Vegan Ranch Dressing made with avocado oil. 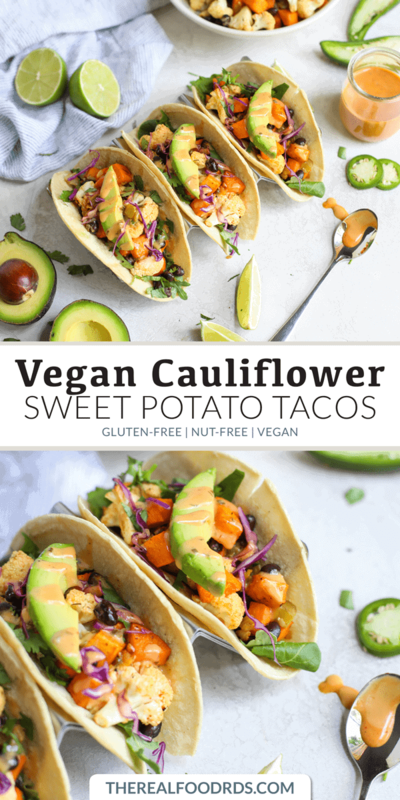 And though these Vegan Cauliflower Sweet Potato Tacos aren’t Whole30-friendly, the dressing is, which is great news for all the Whole30’ers out there who can’t do eggs either. 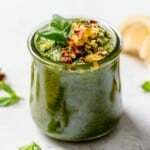 Even if you aren’t vegan or can have eggs, this Primal Kitchen Vegan Ranch Dressing is where it’s at. 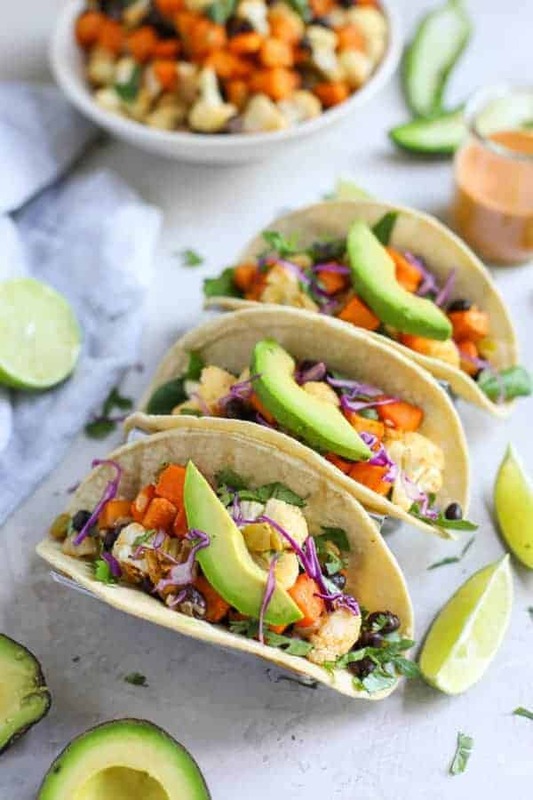 So rich and creamy and when blended with some chipotle peppers it’s nothing short of life-changing and it’s what makes these veggie-packed tacos an eleven on a scale of one to ten. Remember, you don’t have to wait for #TacoTuesday to roll around again. 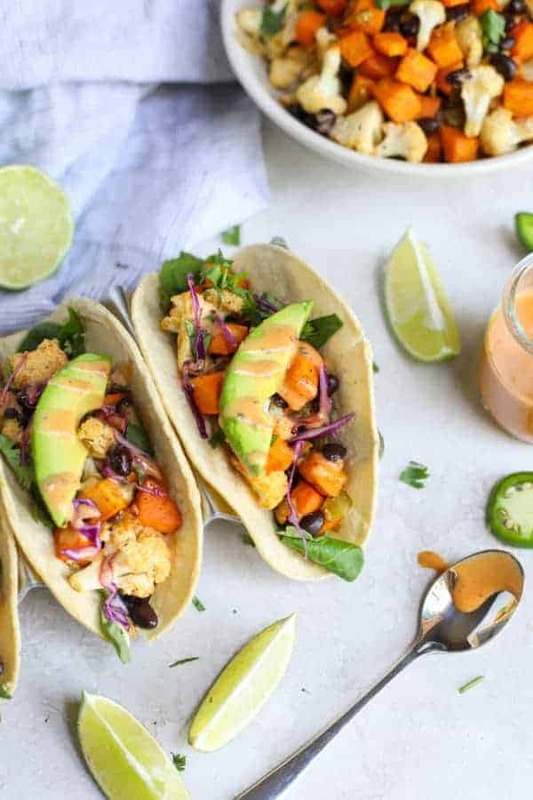 You can make these Vegan Cauliflower Sweet Potato Tacos with Chipotle Ranch any day of the week. You make the rules. Own your taco love. Preheat oven to 400℉. Line a large rimmed baking sheet with parchment paper or a silicone baking mat for easy clean up. In a small bowl, combine oil, lime juice, taco seasoning and salt. 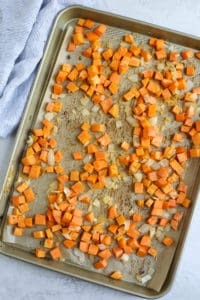 Add onion and sweet potato cubes to baking sheet. 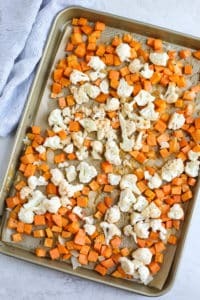 Pour ½ of oil and spice mixture over vegetables and toss to coat. Bake in preheated oven for 12 minutes. After 12 minutes, remove pan from oven and add cauliflower florets, garlic, green chilies, and remaining oil/spice mixture. Toss again to coat and return to oven. 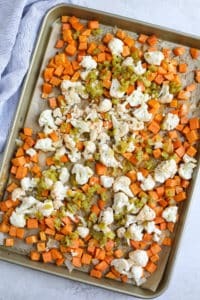 Bake an additional 15 minutes or until cauliflower is crisp tender. 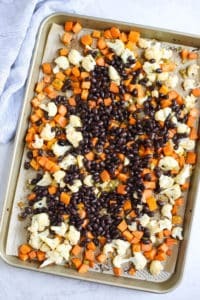 Add drained black beans to baking sheet, stir gently and return to oven for an additional 5-7 minutes or until beans are warmed through and vegetables are tender. 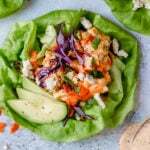 While vegetables are baking, combine Vegan Ranch Dressing with chipotle pepper powder and stir to combine. Chop cilantro, cut limes into wedges and dice avocado for serving. 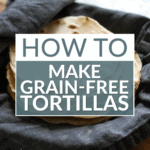 Serve with warm corn tortillas, sauce and all the fixins’! 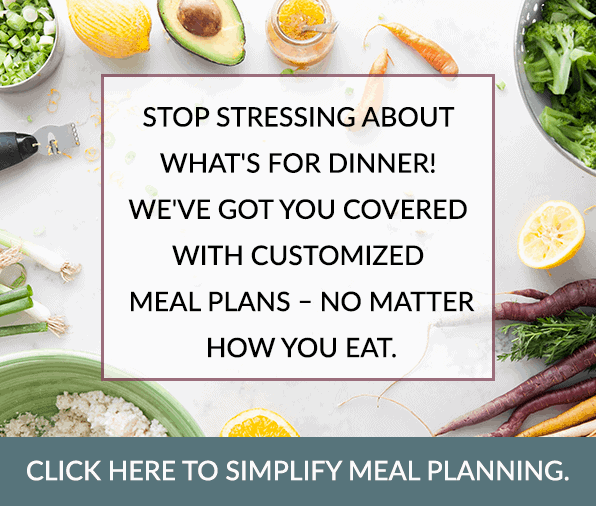 Pin it now – Make it later!